Your wedding budget is tight, and you’re thinking about saving a few dollars by hiring a relative or friend as your wedding DJ; or you’re doing it as a favor to him. One of the things we ask our couples when we first meet with them, is, “Have you ever seen a bad Wedding DJ? What went wrong?” Their answers are very instructive, and just may save YOUR wedding. What would your Wedding DJ do if THIS happened? He got sick on the morning of your wedding. Does he have a backup? He had an accident on the way to the wedding. Does he have a backup? His equipment broke down. Does he have backup equipment? Your wedding venue won’t allow a DJ without liability insurance to perform, and your wedding DJ doesn’t have it. He doesn’t know how to pronounce some of the names of your bridesmaids or groomsmen, so he decides to guess — and guesses wrong. He announces the bride-father dance, but the father of the bride isn’t in the room. Are you prepared to wait through 5 minutes of awkward party-killing silence while everyone stops and looks for dad? He announces the bride and groom’s first dance while your photographer is smoking a cigarette outdoors. Will you be satisfied with someone’s iPhone picture of your first dance? No one is dancing. Does he know how to revive a lifeless dance floor? A guest gets a little “over-served” and decides he should be the center of attention by dancing on a wobbly table top. 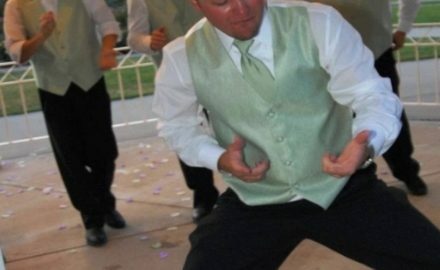 Does your wedding DJ know how to handle it? A guest requests a song with profanity in the lyrics while there are children and grandparents in the room. A guest asks the DJ to break up a great dance set by stopping to wish someone a happy birthday. A guest asks the DJ to let him sing along with a song with no advance permission from the bride and groom. The DJ is a friend or relative, and he wants to join the party by dancing to a few songs, letting the music run out while he sprints back to his console. A guest repeatedly demands to hear a dance song that you have expressly forbidden your DJ to play. Will he cave in and play it anyway? All the dance music you selected in advance consists of a guy sitting on a stool and strumming a guitar (are you listening, Jason Mraz?). No one can dance to that music. Will a friend or relative have the courage to tell you, “No one will dance to this,” while there’s still time to fix your request list and make it more danceable? Your DJ wants to impress some cute girl by honoring her request to play the same song four times during the evening, even though no one dances to it. Someone asks your Wedding DJ to play a song from their iPod without previewing it. Your DJ wants to play some of HIS favorite music, even though it’s not danceable. What could possibly go wrong? PLENTY! A professional Wedding DJ is trained in how to handle all of these and many other potential party-killing situations, and ensure that the bride doesn’t leave the party room in tears. Will an amateur Wedding DJ know what to do? Do you want to trust him — and gamble your friendship — just to shave a few dollars off your wedding bill? This is your first big party as husband and wife, and it will affect your friends’ and relatives’ perception of you for years to come. Think carefully about who you plan to entrust with making your reception successful. – Jay Congdon, President, Fourth Estate Audio – Fourth Estate Audio has been a professional Chicago DJ and Chicago Wedding DJ company since 1965.